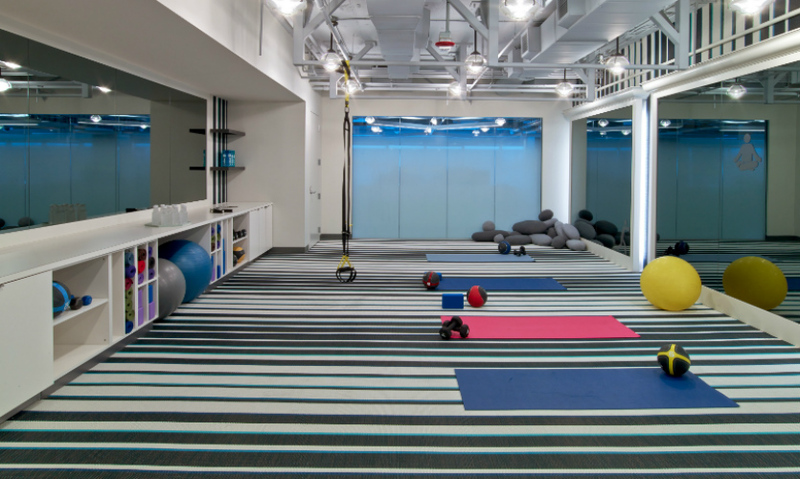 LinkedIn’s new Chicago office makes work more connected, fun, and productive for its Windy City sales team. It’s not too broad a statement to make that LinkedIn has changed the very nature of connection in our world. Since it launched during the dot-com winter of 2002, the professional networking start-up has revolutionized the way we build business relationships and search for employment. LinkedIn now counts 300 million registered members worldwide and employs 5,700 in 30 offices around the globe. The company called on IA Interior Architects to envision a one-of-a-kind space that celebrates the associates and their city. 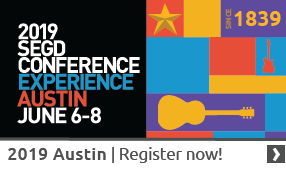 Led by senior associate Neil Schneider and environmental graphics director Julie Maggos, the IA team set out to engage employees and visitors, create excitement, and reinforce the LinkedIn brand. The result is a space that’s smart and professional but not stuffy, and sophisticated but personal and quirky. 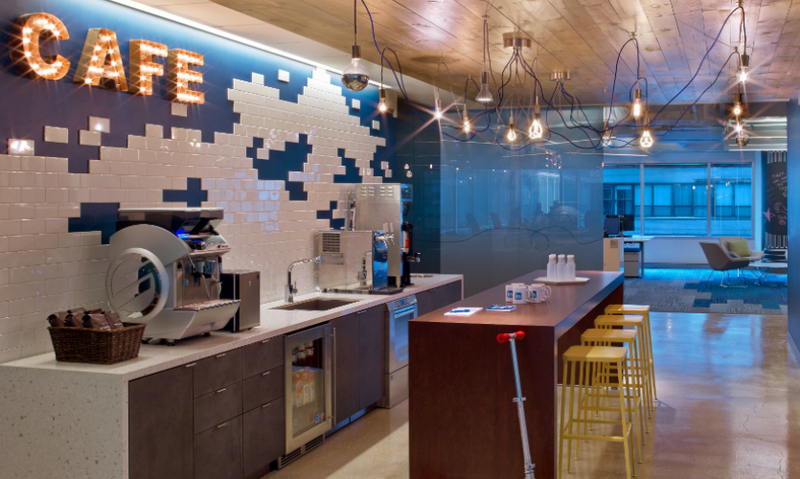 It topped Crain’s Chicago Business’s list of Coolest Offices for 2014. 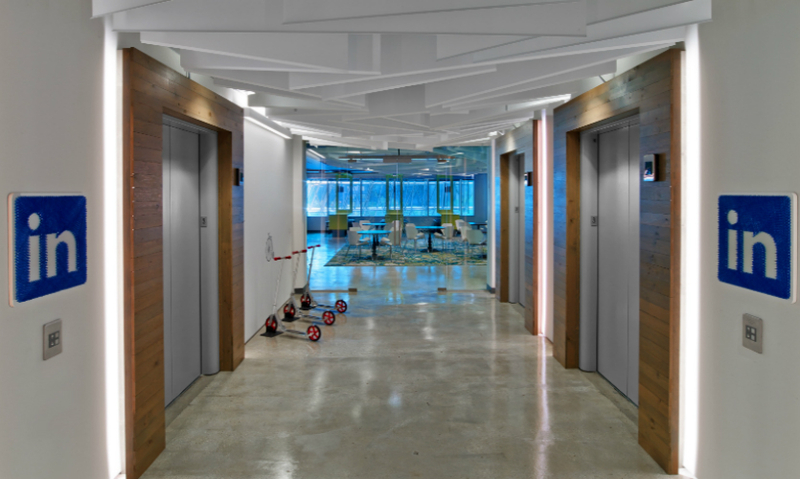 Functionally, the two-story, 80,000-square-foot office is an open plan split 50/50 between collaborative and individual workspaces. Associates have their own adjustable sit/stand desks, but are encouraged to work wherever they feel most comfortable. IA’s plan was designed to serve this very mobile workforce with an abundance of small meeting niches and cozy spaces that invite stopping for conversation and collaboration. “This group likes to move around a lot and they seek out the fun spots for hanging out and meeting,” says Schneider. “They’re on the phone a large percentage of the time, and they’re not tethered to a computer.” As a matter of fact, they’re just as likely to be cruising around the office’s sleek concrete floors on scooters, heading for the yoga studio, perching on foam cushions in a stairwell nook, taking a quick ping-pong break, or relaxing in cafeterias where three meals a day are served free. The IA team wanted to facilitate connection and the blending of different generations and backgrounds within the LinkedIn team, just as the LinkedIn platform does. 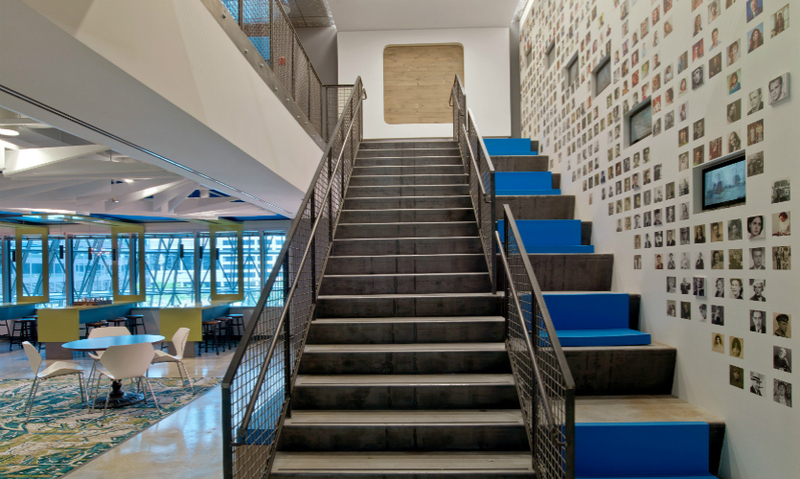 A central staircase is the most obvious expression of this, linking the two floors while providing comfortable seating alongside for impromptu relaxing or collaboration. Along the stairwell, a collage of LinkedIn portraits emphasizes connection among people of varying ages and backgrounds. 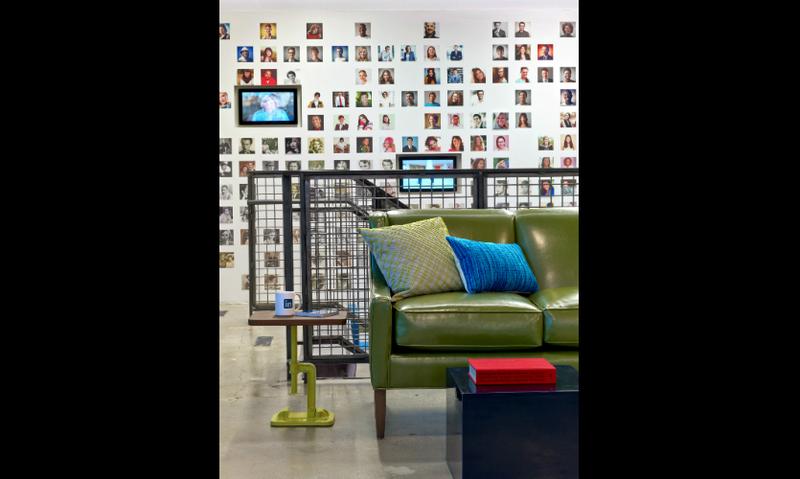 Reproduced on custom wallcovering by Moss Environments (formerly Andres Imaging & Graphics), the static portrait collage is punctuated with digital photo frames that scroll more portraits. The IA team also focused on the notion of connection through common threads, and expressed this via string art throughout the space. In the elevator lobby, a pair of LinkedIn logomarks is rendered in blue yarn. 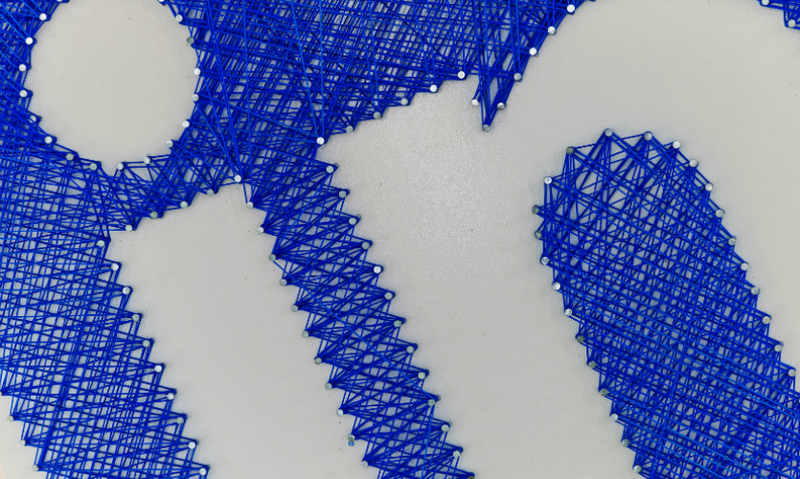 The main reception desk, slated for Phase 2 of the project, will be a string-art map of Chicago. 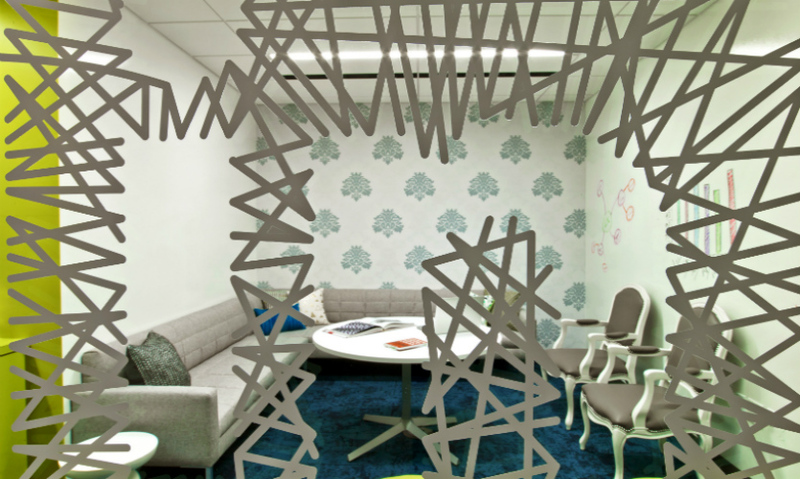 Vinyl graphics on glass conference walls also reference the string motif, forming a relief of the company logo or unwinding to spell out the room names. A second theme for the space was “old and new,” another take on LinkedIn’s mission to link professionals across generations. In a new space that’s clean and minimal, the design team tossed in retro and vintage elements with contemporary colors and finishes. 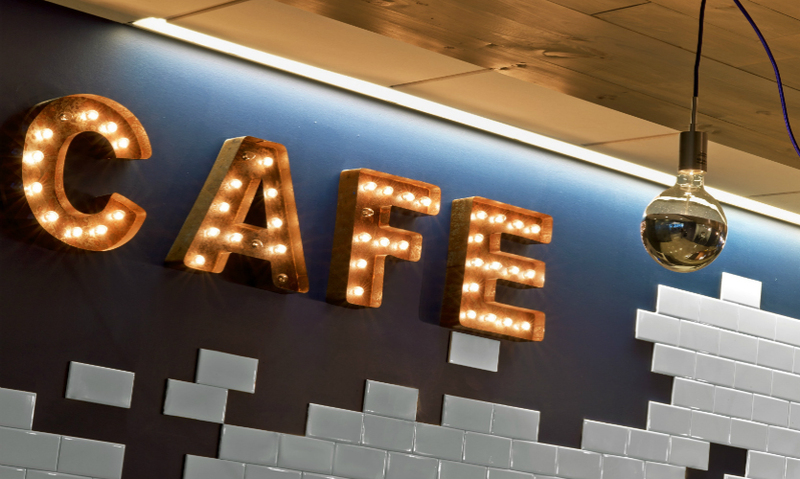 Wingback chairs sport modern fabrics, brick walls bear ghosted sign graphics, and vintage channel letters identify a contemporary café space. 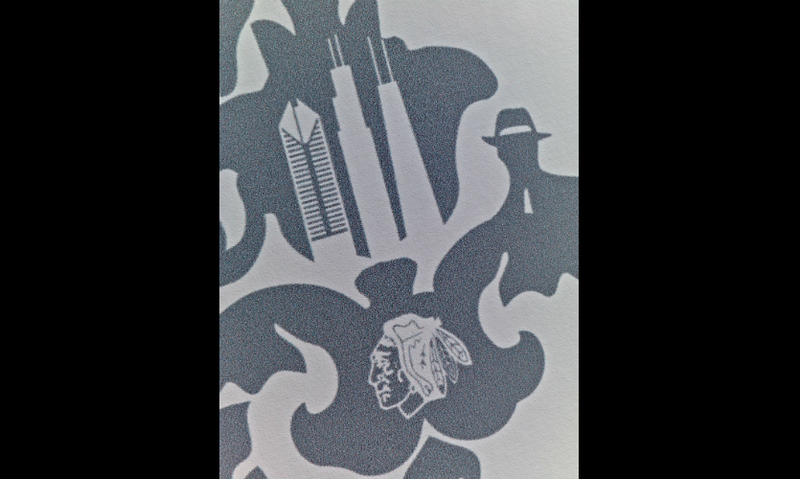 One of the many hidden gems in the space is custom wallcovering that looks like traditional damask from afar, but on closer inspection, reveals that its pattern is comprised of many Chicago icons, including Willis (formerly Sears) Tower, the Chicago Blackhawks logo, a gangster, and other images. 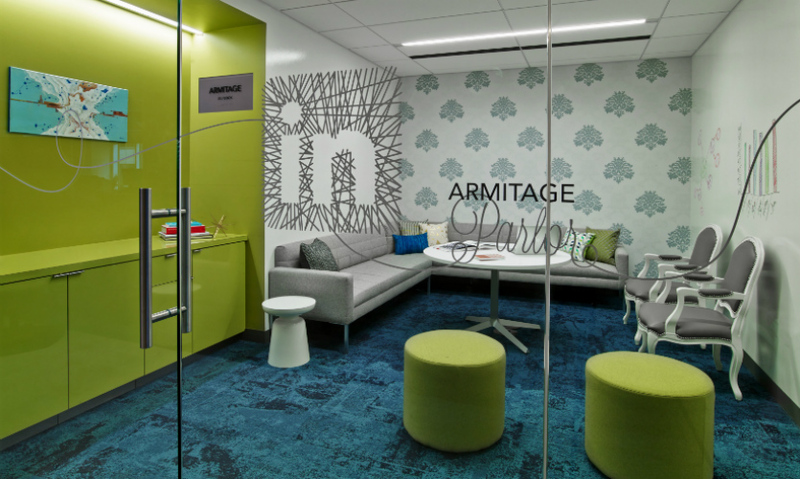 The IA team also wanted to create an office that could never be mistaken as being anywhere else but Chicago—so the “neighborhood” spaces are inspired by popular landmarks, destinations, and local history. Environmental graphics were key to the mix. Hoffman’s Still at the 525 Club, a speakeasy-inspired lounge, was named after LinkedIn founder Reid Hoffman and bears the address of the building. 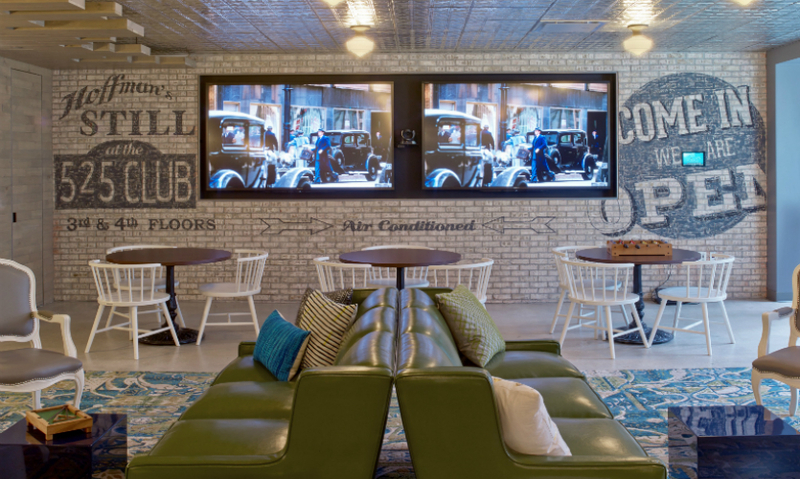 Here, a tin ceiling and retro furniture are set against a brick wall that contains ghosted graphics and a pair of large-screen displays showing gangster film footage. 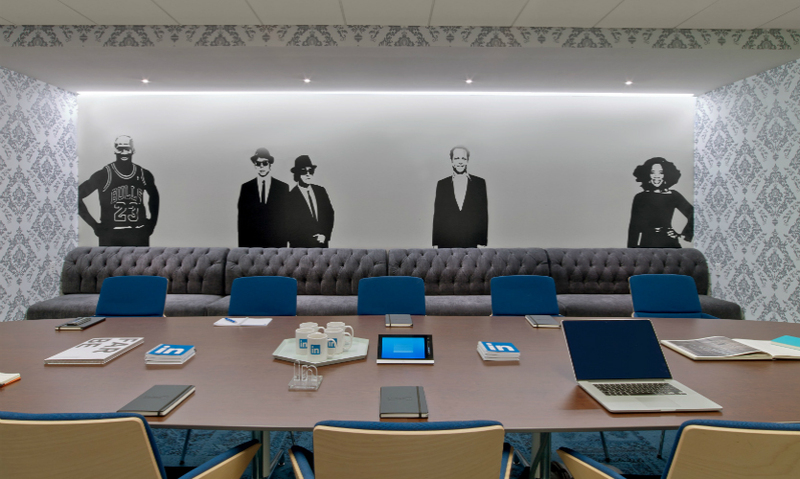 In the main conference room, vinyl graphics depicting Oprah, Michael Jordan, the Blues Brothers, and actor Vince Vaughan is the first thing that video conference callers see when they link in to the Chicago office. 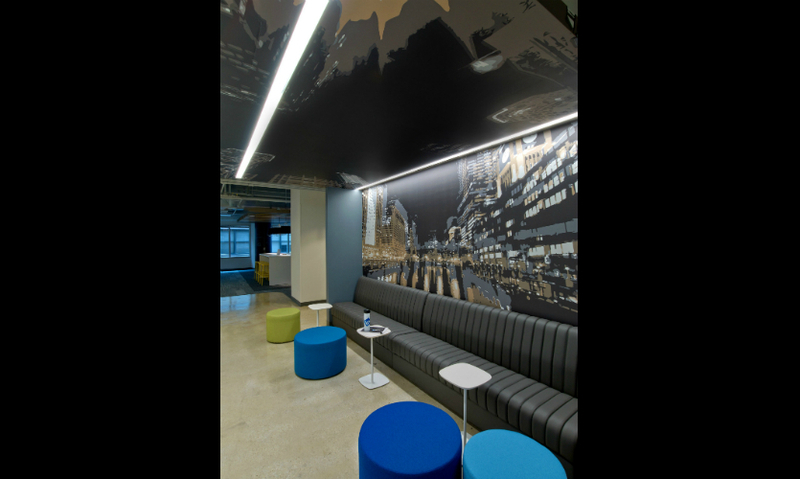 In another informal gathering area, the IA team created an homage to the famous Chicago River architectural tour with a mural that spans the walls and ceiling, recreating the view from a tour boat. To add to the Chicago vibe, the team also commissioned several local artists to create murals. 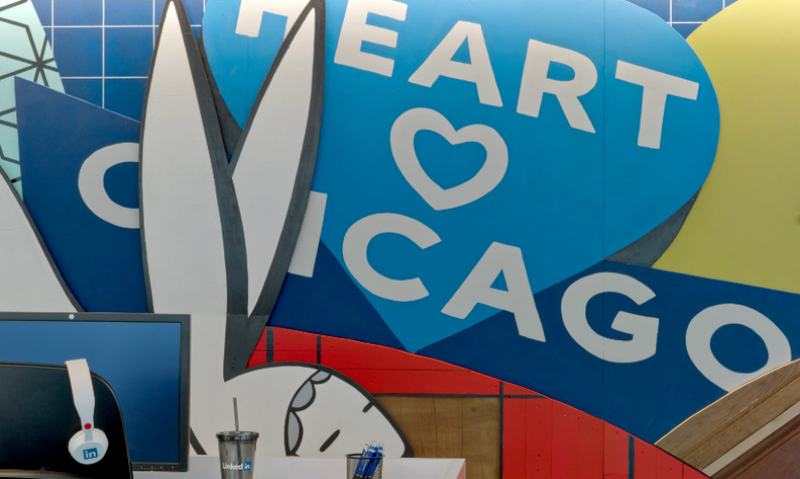 Chris Silva’s Heart Chicago mural is a three-dimensional, mixed-media piece that spans a long wall in the open workspace area. 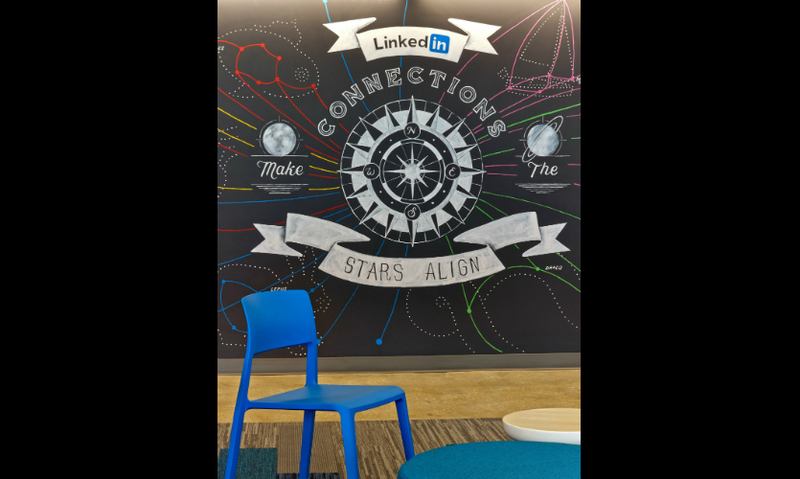 A companion mural by chalk artist Amanda Paulson focuses on LinkedIn’s key brand values and invites employees to add to it with their own chalk musings. Maggos and Schneider consider the project a huge success because IA’s interior and graphics teams worked so closely together from the outset. 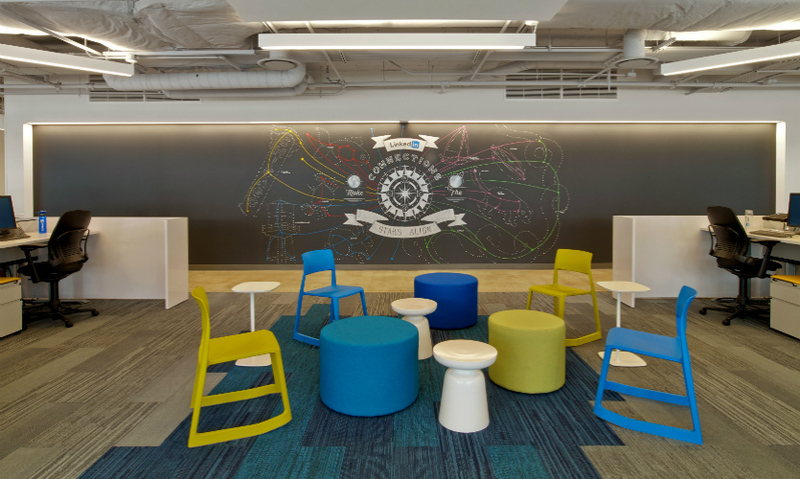 “Rather than being an interiors project that we added some graphics to here and there, we created a very integrated storyline that integrates all of the elements—furniture, finishes, colors, lighting, and graphics,” notes Maggos. The team’s biggest challenge was a sort of embarrassment of riches. The client’s trust—and its appetite for a dynamic, quirky, and fun space—were such that they were constantly pushing the IA team for more. “They originally wanted things like a fire pole, a trapeze, and hidden doors,” remembers Schneider.